Founding Editor Stuart Jones visits China to see how BYD is rapidly emerging as supplier of electric bus drivetrains to the world. Across the world, city authorities are taking measures to improve air quality on their streets and tackling public transport emissions. Among the easiest ways of making a meaningful difference in the short term is to encourage the use of electric propulsion by discouraging or banning diesel- and petrol-powered vehicles. And at the forefront of those offering electric buses is BYD (Build Your Dreams), a Chinese company which has grown from being a small producer of batteries for cordless telephones to become a world player. With success in its core markets of electronics, ‘new’ energy, and automotive, it has recently turned its attention to the rail transit arena. 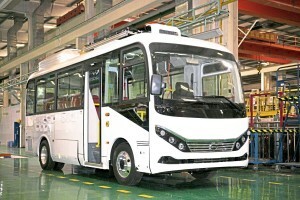 In the electric vehicle market, BYD claims to be the first and only company to provide full market new energy solutions. It specialises in the seven sectors of: public transport; buses, coaches, taxi, construction, municipal transport, passenger cars and delivery vehicles. It also plans to expand this to include airport, port, warehouse and mining vehicles. Under the leadership of Mr Wang Chuanfu, who continues to run the company today, the business was established in 1995 with 20 employees competing with the likes of Panasonic and Sanyo to supply batteries. Within three years it was supplying over 75% of that market, having engaged with manufacturers such as Motorola and invested heavily to ensure that it could supply their needs to their quality standards and at a greatly reduced price. Since then, the business has expanded exponentially and in 2017 it is expected that turnover will be €18,886m, up from €12,802m in 2016. It claims a 13% share of the global EV and PHEV markets, has delivered over 20,000 electric buses, has a 23.3% share of the global energy storage market, is the world’s largest iron phosphate battery manufacturer and holds in excess of 12,000 patents. 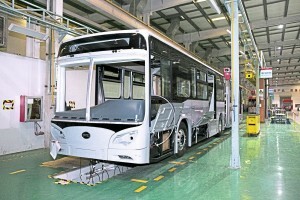 Currently BYD employs more than 223,000 people, the majority in China. In Europe, it was as early as 1998 that the company set up BYD Europe BV establishing its headquarters for the region near Rotterdam in the Netherlands. It concentrates on the electric vehicle, solar and energy storage markets and in September 2015 moved to much larger modern premises at Schiedam. It was under the auspices of BYD Europe that the trade press visited China accompanied by its MD, Isbrand Ho, Marketing and Public Relations Manager, Penny Peng and Xian Ou Leow from her department, along with a number of other Chinese members of the team. Mr Wang, speaking through an interpreter, said that Shenzhen is one of the most prosperous cities in China. The Chinese Government faced the linked problems of how to improve the environment and how to tackle congestion. Despite making up only 2% of vehicles, public transport accounted for 30% of road pollution, so reducing it, particularly PM2.5 particles, was a priority for mayors. In Beijing, there were 30,000 buses and 66,000 taxis yet because of the hours they worked and the fact that cars had cleaner engines, they produced as much in emissions as the five million cars in the city. Trucks made up the other third of road transport emissions though they were only 18% of the vehicles. 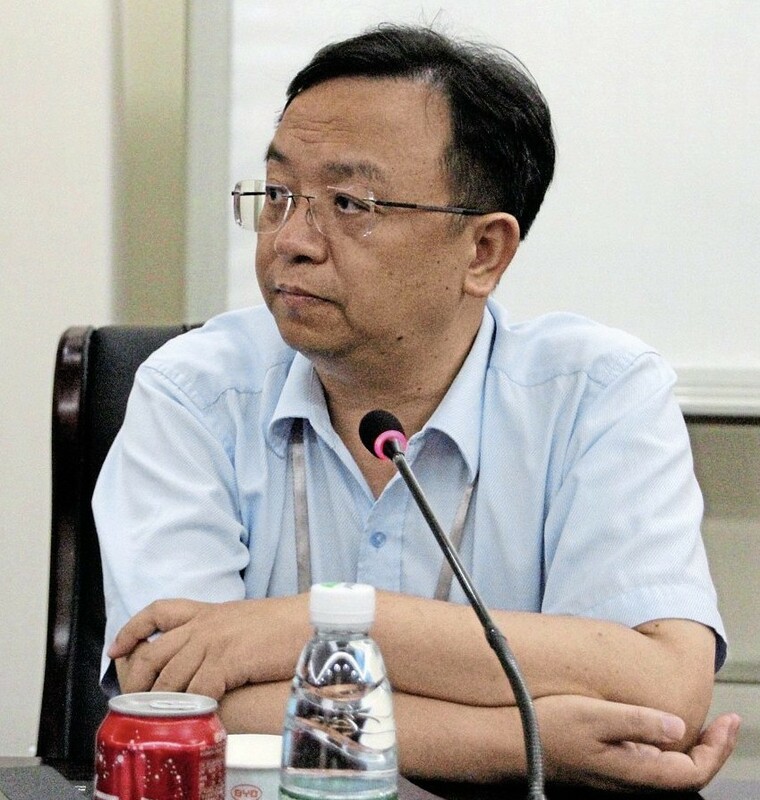 He also talked about BYD’s rubber-tyred, column-supported, Skyrail monorail system, which he saw as a solution to the congestion issue, and which costs a fifth of the price of an underground rail system. He sees it resolving the issues of increasing car usage with resulting congestion and the rush of people from rural areas to cities that sees 20 million relocate every year. There are over 350 second-tier cities in China that cannot afford or justify ‘tube’ systems and there is a lot of enthusiasm for Skyrail, says Mr Wang. Already there are five cities committed to it with another 15 under discussion. 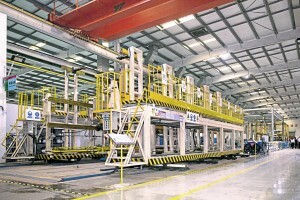 A 1.1km demonstration system at the plant is currently being extended to 10km to serve the entire site. The first city systems to open will be in Yinchuan, Ningxia on 1 September this year. Elsewhere, in Shenzhen there is commitment to a 55km network and in Shantau a 250km network. Among those planning their own are Xi’an (population 8.7m), Guang’an, Bengbu, Jillin and Tianjin (population 12.7m). In a question and answer session, Mr Wang said that most Chinese electricity is sourced from coal-fired power stations but there is an increasing amount of nuclear, solar and wind power. For bus charging infrastructure, although the company did have the technology, it preferred to work with partners such as SSE in the UK to supply it. Asked about battery life he said that most Chinese bus contracts are for eight years and he is looking forward to buses coming back. The batteries on buses supplied so far are within specification with degradation below 20% but then ready for a second life. Asked whether electric bus prices could come down to those of diesels he said that total cost of ownership would be lower than diesel and that parity would come very soon. There are many different battery technologies that can be employed, all of which have strengths and weaknesses. For BYD, the choice for commercial vehicle applications is the Lithium Iron-Phosphate (LFP) battery. This doesn’t have as high an energy density as a nickel cadmium battery but BYD prefers the technology for bus and other automotive applications because of the safety, stability and environmental friendliness it offers, pointing to the fact that none of the E-Buses built by BYD so far have ever caught fire, the fact that it can be recycled and that no pollution is created in its manufacture. Each battery should be good for 10,000 cycles and the likely recharging requirements of a bus over eight years should only be around 3,000 cycles which should enable it to undertake 6,000 more cycles in a second life. BYD believes that, by 2020, LFP batteries will be offering 160KWh whereas the NCM (nickel cadmium) will be around the 250KWh mark. Isbrand Ho said that BYD is already looking at three or four ‘next-generation’ technologies. It has identified a new technology suitable for the car market and would announce it soon. 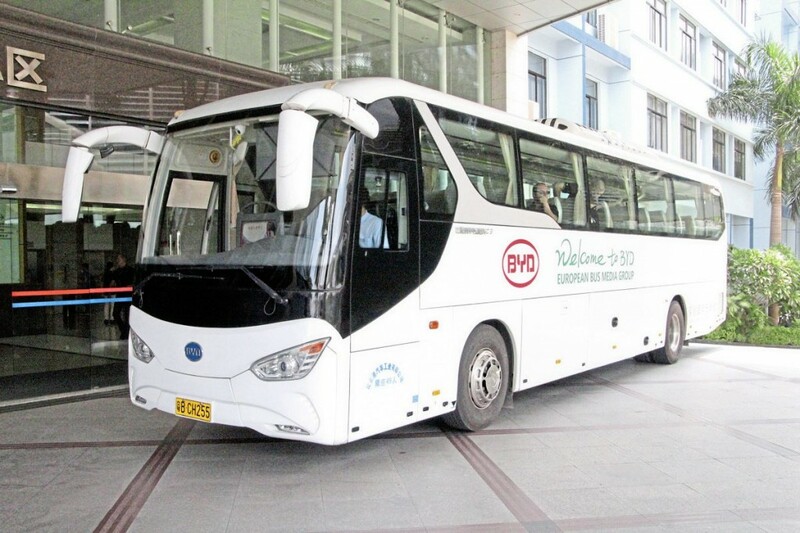 As well as manufacturing the batteries, BYD also designs and makes the power distribution unit, charge-discharge motor controller and the permanent magnet synchronous electric motor, integrated within the hubs on the drive axle of its buses. 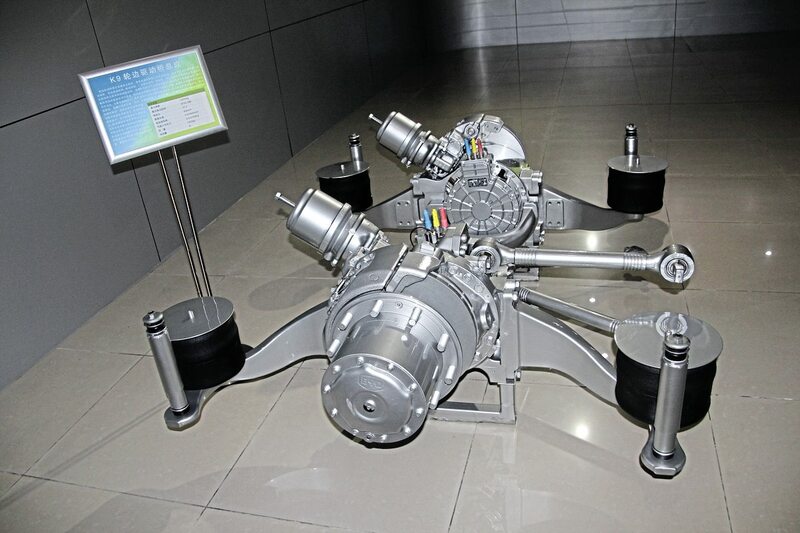 BYD’s drive system has the liquid cooled traction motor and two-stage reduction gearing integrated within the wheel hubs of the axle, with no transmission shaft. Maximum power in each wheel can be either 90kW x2 or 150kW x2. 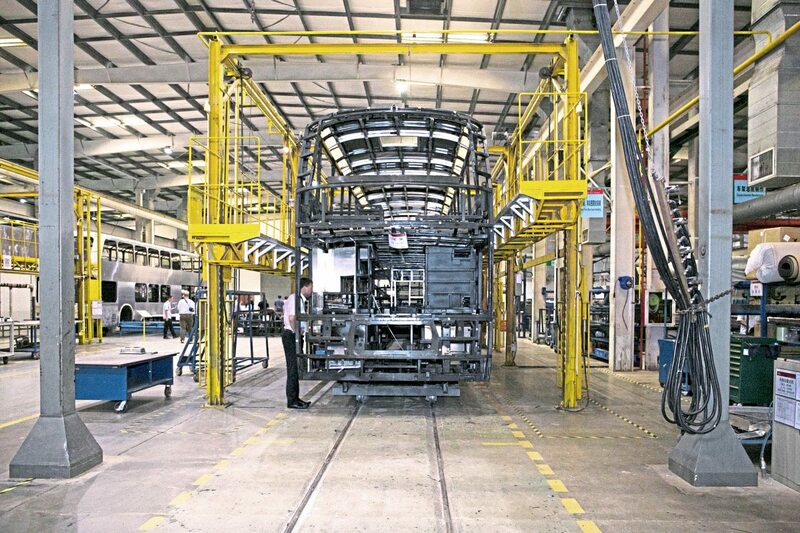 These drivelines are installed in bus bodies built at BYD in China but the initial demonstrators sent to the UK are unique – in future, the drivelines will be shipped to Europe, with new bodying plant now being built in Hungary and Northern France. In the UK, BYD continues to partner ADL for right-hand drive bus bodying. Combined, the mainland European plants will initially have a capacity of 400 units a year but with scope to double or even treble this production level. In time, Hungary is expected to produce the drivelines, too. 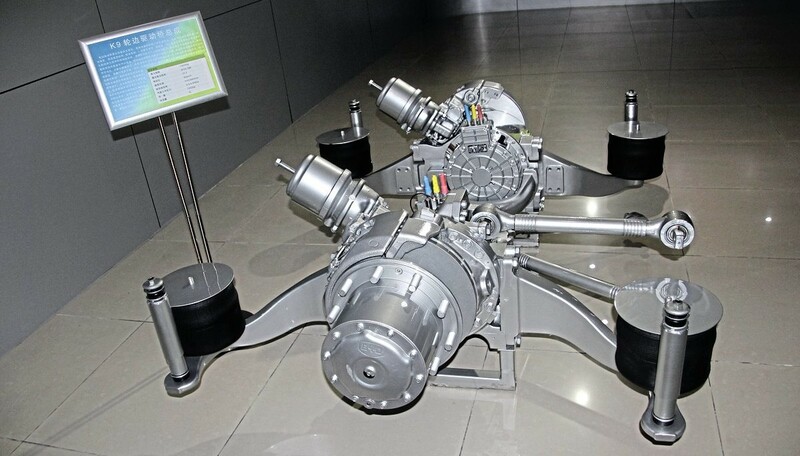 BYD’s drive system has the liquid cooled traction motor and two-stage reduction gearing integrated within the wheel hubs of the axle, with no transmission shaft. Manufacture of the company’s iron phosphate batteries for automotive applications takes place in two plants. There is a small facility at Huizhou with a production capacity of 2GWh but the bulk of production is undertaken at a state-of-the-art plant in the Kengzi district of Shenzhen which has a capacity of 14GWh, taking total BYD Fe battery capacity to 16GWh. Completed in two stages during 2015 and 2016, the Kengzi factory covers 160,000 sqm and is virtually fully automated. 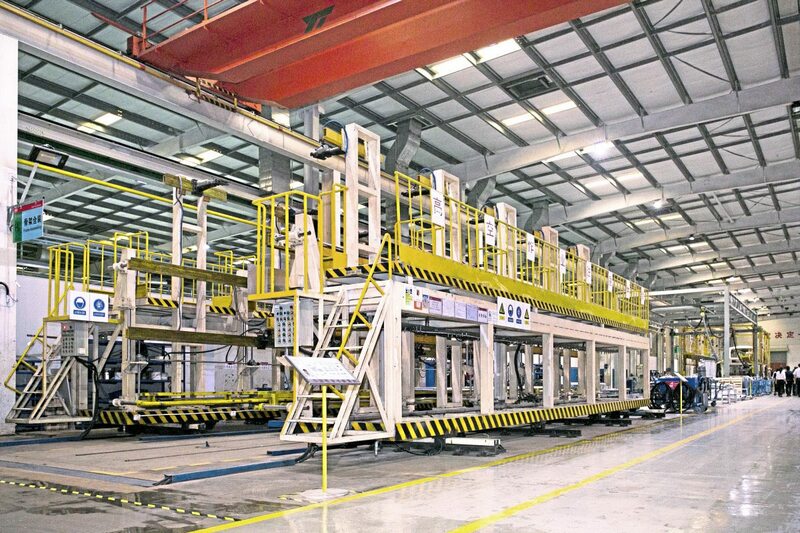 The 1.5km-long production line handles the six processes of mixing, coating, pressing, slitting, winding and assembly after which eight refining processes are undertaken including drying, injection, storage, formatting, aging, capacity checking, sorting and module packing. It is crucial to the performance of the chemicals within a battery that the elements do not come into contact with foreign substances during production. 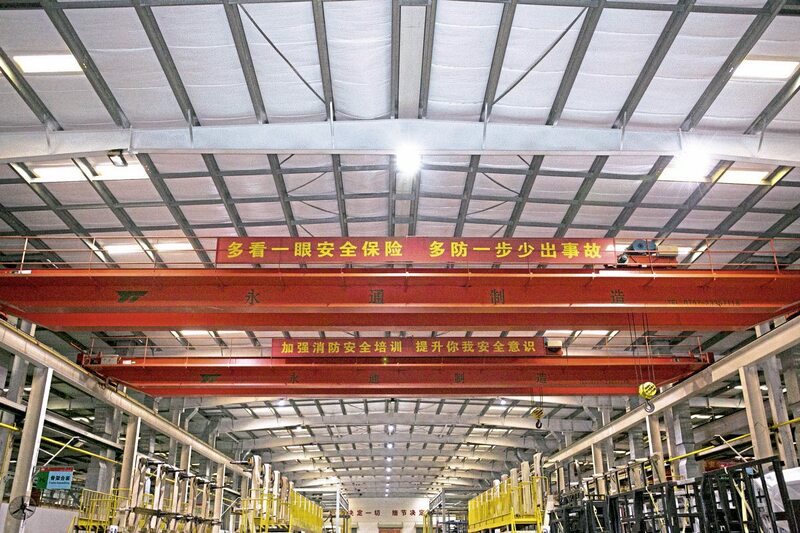 Any failure in this area may not become apparent for months or years after the contamination occurs which is why BYD has gone to such lengths to automate everything. The only humans you see are those checking machines and undertaking maintenance, the exception being the transfer of completed batteries which humans undertake more efficiently. The complete battery production process takes 28 days of which over 70% is storage time, enabling chemical reactions to take place and the batteries to stabilise. For example, each battery spends ten days in one of two high-temperature rooms. Self-discharge rates are checked and have to meet very low tolerances. Once the batteries are complete, units taken randomly from production are checked in the test building. Not only is the safety and security of the battery checked, there are a number of more physical tests undertaken including drop, short circuit, over-charge, over-discharge, nail penetration, crush, external fire and highly-accelerated life tests. Different modules are used for different applications although all use the same chemistry. For a K9 bus, thirty modules will be used, weighing three tonnes. A Qin model hybrid car will use 10 modules, all in series. 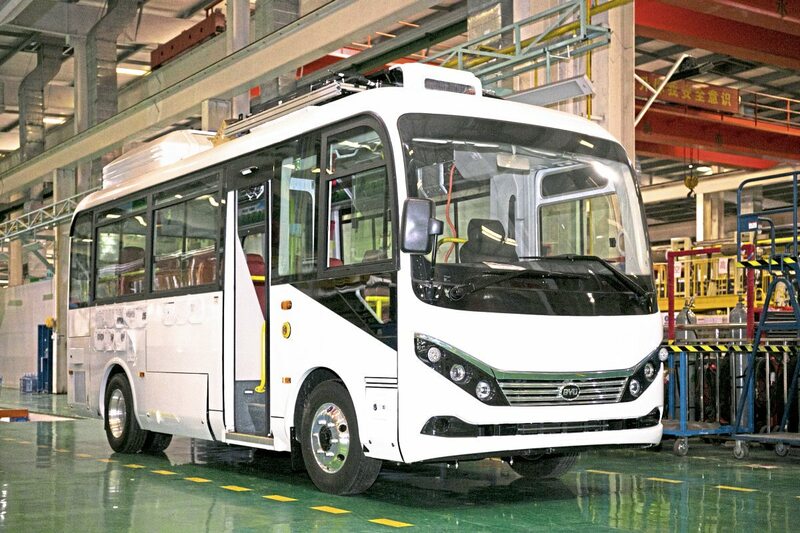 One of the highlights of the trip had been a planned visit to the bus manufacturing plant at Shanwei, said to be the largest electric bus manufacturing plant in the world, where the bulk of BYD’s bus output is produced. Here, the two linked plants built 5,000 units each last year and are capable of 10,000 annually, a figure the company plans to achieve this year. Unfortunately the biggest typhoon to hit the region for some years blew in on the day of the planned visit and the high-speed trains that were to have whisked us there were cancelled. Despite only learning of the problem after the party had gone to bed, our hosts set to work and arranged an alternative programme for us. This included the rare opportunity to tour BYD’s prototype development facility in Shenzhen, where photography other than by their official photographer is forbidden. Last year, this facility developed an astonishing 60 new models and that figure has already been achieved again within the first eight months of this year. As well as prototypes, early production runs and some export vehicles take shape here. Illustrating the extent of their ambitions and the scope of their capabilities, we saw three-axle double decks for South America, artics for Oslo, single-decks, coaches and minicoaches on the lines. In April this year, BYD opened a new factory at Komarom in Hungary, with a 60,000sqm production area that will supply part of European demand. The modern buildings had previously been used briefly by Nokia until being mothballed in 2010. Investment in the operation between 2016 and 2018 is expected to be €20m. Employing up to 300 people, it will have an initial single-shift annual production capacity of 200 units with plans in hand to double this. 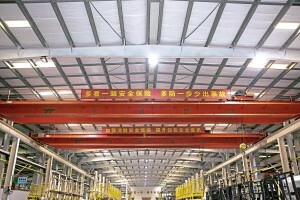 It is split into five main sections; a bus and truck assembly hall; an office block; a battery test and maintenance centre; a paint shop; and an inspection line and water leak test booth. Once bus and coach production is established, it is planned that Komaron will add forklift trucks to its portfolio and thereafter build trucks and municipal vehicles, although the number of these built would be included in the overall productions levels previously mentioned. As well as the Hungarian plant, there is a new facility at Beauvais in Northern France being converted for BYD which will have an initial capacity of 200 buses, though it could be expanded to 1,000 units annually. It is intended that production here will focus on the French market, which BYD believes will rapidly adopt electric propulsion. Previously a Michelin factory, it occupies 70,000 sqm. Completion of the work necessary to commission the plant is expected to be in the first quarter of 2018. For the UK, the plan is somewhat different, in that BYD will not offer complete buses, as it did to Nottingham Community Transport and initially to TfL. 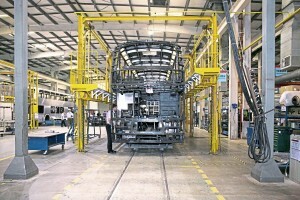 Instead it will supply chassis with its electric drivelines to ADL, which will body them. At present, these chassis are being manufactured in China but the intention is that, as the Hungarian plant expands, it will take over the building of these units, which should also reduce shipping costs. BYD has been working successfully with ADL and since the high-profile order from Go-Ahead London for 51 buses based at Waterloo for the Red Arrow services, BYD has taken other orders that will take the UK fleet to well over 100. Another interesting facility within the Shenzhen headquarters complex combines the Safety, EMC (electro-magnetic compatibility) and NVH (noise, vibration & harshness) laboratories, which together represent an investment of RMB350m (£40.77m). While the safety centre carries out all manner of crash tests for cars, the EMC Lab (the largest of its kind in China) and the NVH facility (rated first for accuracy in China) can both handle vehicles of all types including buses and coaches, indeed, there was an electric bus in one of the laboratories when we called. Complementing the test facilities is a test track with a 3.8km long perimeter road featuring banked curves, straights, different surfaces, a vehicles dynamics area, and various inclines and ramps. Cars shot round the track covered in black and white disguise vinyls while we tried out a couple of models from BYD’s 4×4 SUV range; one a mid range, all-electric Song 542 and the other a top-of-the-range Tang 542 hybrid electric, on the flat. I’m not an SUV man myself but they accelerated and stopped well and held the road when you pushed them in corners. 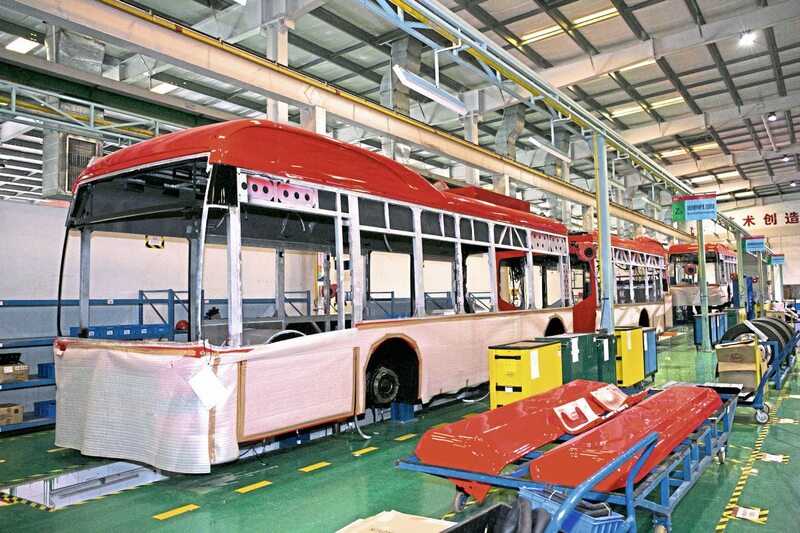 In the UK, the model line-up consists of 10.8m and 12m lowfloor city bus models with BYD chassis and ADL bodywork, although both sides have talked of other options to come. 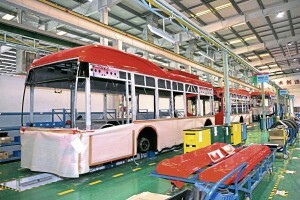 It has not yet been confirmed, but it is an increasingly open secret that ADL and BYD will jointly produce a double-deck electric bus for the UK, with the batch of five full electric, fully BYD-built ‘deckers being operated by Metroline’s Willesden depot on TfL’s route 88 likely to remain unique. In left-hand drive European markets, a full E-Bus range is offered including an 18m artic, 10.2m double-deck bus, a 12m coach and 12m airport apron bus as well as the 10.8m and 12m models. All have aluminium bodies mounted on steel chassis. New at Busworld will be an 8.75m long midibus with air conditioning and many big bus features. 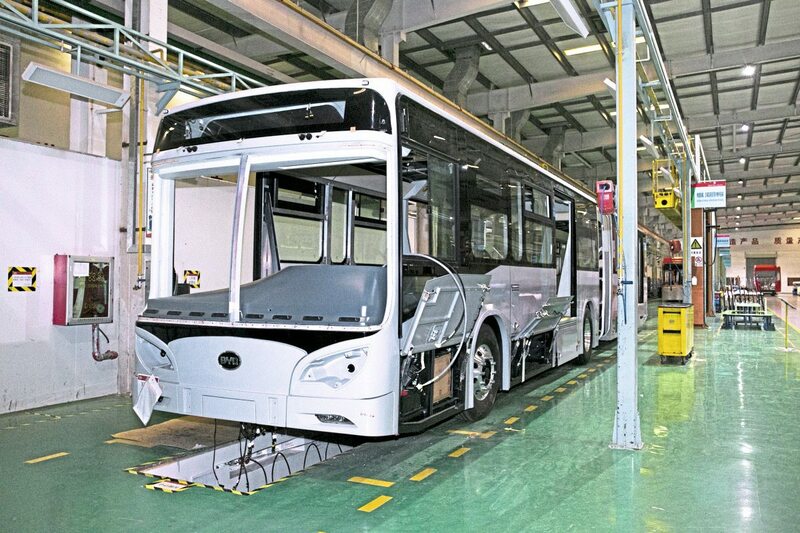 Featuring new frontal styling that is to be carried across the BYD range progressively, there will also be a 12m model on the stand, the first bus to be completed at the Hungarian plant. BYD has exhibited at several previous Busworld events in Kortrijk and this year will be located on stand 135 in Hall One, occupying 500 square metres. The Mayor of Paris has said that diesel-fuelled coaches will be banned from the city by 2020 and, with London’s mayor’s prone to introducing sweeping restrictions that take no account of operator’s ability to replace their fleets, it may well be that the UK will see electric coaches. 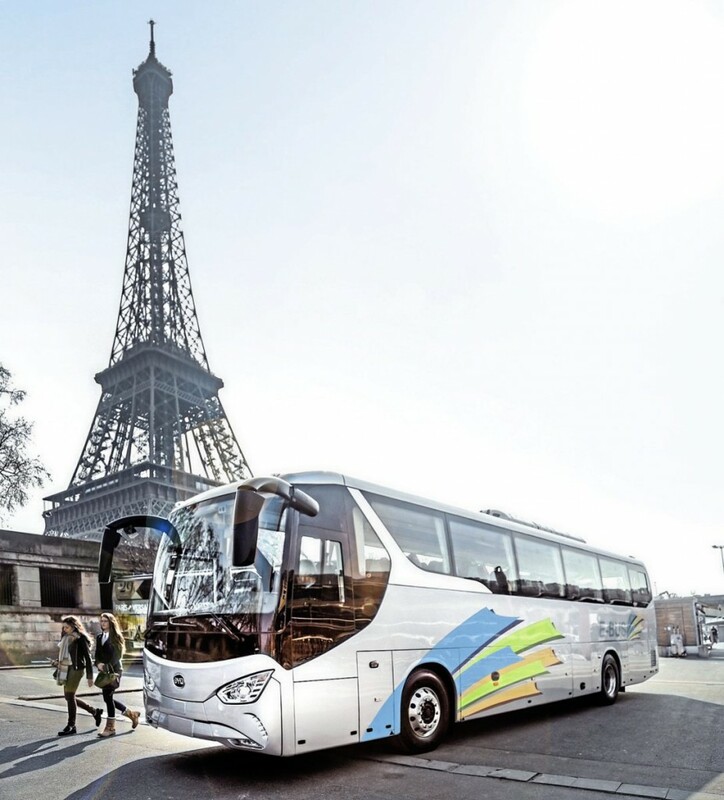 BYD has already supplied an electric coach to Paris operator, Go Green and on the streets of Shenzhen large numbers of yellow and white painted electric coaches are to be seen carrying commuters and others. Throughout our visit we travelled on a 12.9m C9 electric coach with 6.85m wheelbase and twin 180kW motors. This proclaimed ‘Welcome to BYD – European Bus Media Group’ along both sides. One thing it highlighted was the need to ensure drivers are properly trained on how to drive it, because I found that the comfort depended very considerably on the driver’s approach; more so than on a diesel because of the immediacy of maximum torque availability. For most of the stay we had an excellent driver but on one day we didn’t and his use of the accelerator as an on/off button was nausea-inducing. With a careful driver acceleration was smooth and comfortable, with the bad one it was not, causing the coach to nod fore and aft. It was generally quiet though, as I have found on all electrics, this served to highlight all manner of other noises, especially the air conditioning which was very effective. So effective indeed that on a number of occasions when we rejoined it, the heat of the day coupled with the cold of the interior and the single glazing had created heavy condensation on the outside of the windows. I won’t make other body-related observations because this was a Chinese specification model and anything coming to Europe would be considerably different; though it might even have European-sourced coachwork. It was difficult to judge electrical consumption, though my impression that the charge percentage remaining indicator seemed to drop quite rapidly may well have been influenced by the driving style and the level of traffic congestion we encountered. Electric coach – The Mayor of Paris has said that diesel-fuelled coaches will be banned from the city by 2020 and, with London’s mayor’s prone to introducing sweeping restrictions that take no account of operator’s ability to replace their fleets, it may well be that the UK will see electric coaches. As of the end of June, BYD’s share of the European electric bus market was 27%, we were told. Although the UK is currently the market in which it is most successful, it has won orders across Europe and beyond, a recent success being for Egged in Haifa, Israel, which is taking 17 12m E-buses. Orders have been placed by over 60 cities in 21 European countries and regions. Worldwide, BYD operates on six continents with product in over 200 cities in 50 countries. The next deliveries for the UK will be 12 for Arriva in Liverpool. Mr Wang mentioned Shenzhen converting to electric buses and we visited the company that operates the biggest fleet of BYD electric buses in the world: Shenzhen Bus Group. With the Chairman and CEO away on business in Singapore, we were greeted warmly by the Vice Secretary of the Party Committee of Shenzhen Bus Group accompanied by his Transport Manager, New Energy Department Manager and two office General Managers as well as several photographers whose pictures of the visit were later to appear on Social Media reports from the operator. The company has been trading since 1975, although Shenzhen itself did not become a city until 1980. 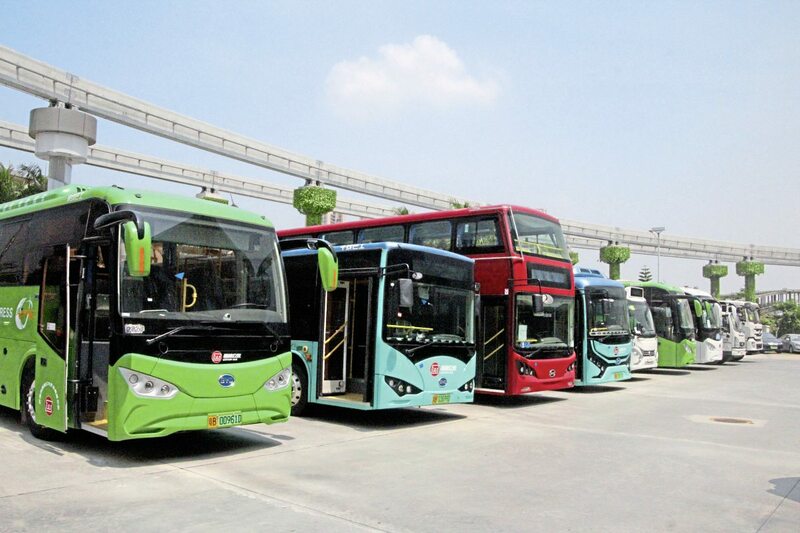 It has 26,000 employees and 5,698 buses, all of which are electric and 80% of which were supplied by BYD, the majority of them delivered over the last two years. Some 4,000 buses are 10.5m long, with 967 only 8.5m, and between 300-400 12m buses. There are also 33 10.2m double-deckers used mainly on tourism services in central Shenzhen, though none are open-toppers. Two articulated 18m buses are being evaluated on restricted routes. Some buses, but not all, are fitted with wheelchair ramps and all that I saw were step entry. Every bus has GPS and seven monitoring cameras. ‘New energy’ buses have been operated since 2008, starting with hybrids. The very last fossil fuel bus was taken out of service on 8 June with a ceremony held a week later to inform the public of the milestone it had reached. The company also operates 5,300 taxis, over half of them full electric and once again, the majority made BYD E6 models as used in London by Uber. Shenzhen covers a vast area and SBG’s 180 depots, many of them small, are spread across this, operating 344 routes. A total of 76 of the depot premises are big depots. There are two types of depot: those that only park buses at night and have repair facilities, and those that only park buses during the day. Some depots are also bus stations. On average, buses operate for 15 hours a day and cover 180km, although the highest daily mileage is 300km. BYD usually recommends AC charging solutions in Europe but can also supply DC charging and ‘opportunity charging’ options. SBG has gone for DC charging having completed its first individual charging station in July 2010 linked to the grid, following up with its first circuit charging system 18 months later. It now has 74 charging stations with 1,174 individual charging posts with a further 33 stations and 564 charging posts under construction. The eventual split of charging points to buses is expected to be 1:1.9. The company opted for DC rather than AC charging because of the advantages it offers in the charging device being on the charger rather than the bus, as well as the frequency and rate of charging that can be accomplished. It now has closed-circuit charging systems which cost one third less to construct and offer advantages in that vehicles do not need to be moved around during charging at night, making layouts at charging stations more convenient. With off-peak electricity costing only a third of peak hour supplies, night charging is employed where possible. I hope I understood correctly that SBG spends RMB200m (UK£23.35m) annually on electricity for recharging. At Xiang Meibei depot, we were shown a new system, installed with a third party company called Winline, that collects solar energy from panels over the charging bays and feeds it directly into charging cabinets. This offsets the difference between off-peak costs of RMB 0.22 per kW and peak costs of RMB 1.1/1.2 per kW. Power generated in this way and not used to charge buses is sold back to the grid by Winline. There is no ESS (energy storage system). Charging a bus using the system takes 90 minutes but six hours if four buses are connected simultaneously to the system. A hundred buses park at the depot overnight but many others call in during the day for top-ups. Once the charge level drops to 30% it is recharged to 100%. Just as in the UK, installing the necessary infrastructure is a process fraught with difficulties. SBG does not own all of the sites it uses and properly identifying who does own some of them is an issue, as is obtaining access across other party’s property for contractors. Another issue is illegal construction on land where services need to be laid. Although the company successfully keeps the fleet recharged, staff admitted the current distribution of charging stations was unbalanced, especially in the city centre region. Public feedback to the electric buses has been good because they are not so smelly and drivers like them because they have automatic transmissions rather than the manuals of their predecessors. 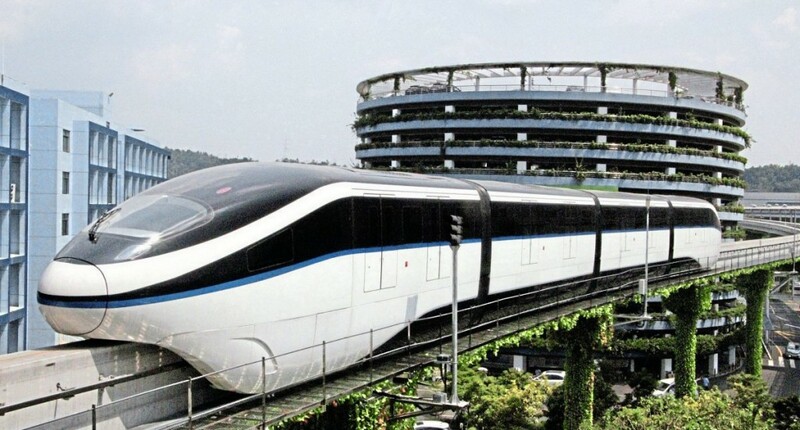 The breadth of BYDs product offering is enormous ranging from telephone batteries to the new Skyrail monorail system. It currently still produces small internal combustion engines for its car ranges, although it plans to stop doing so as soon as demand for full electrics makes it viable to do so. The car range is an expansive one, with most models named after former Chinese dynasties. While we were in Shenzhen, we were given the opportunity to tour the Denza car plant which opened in 2014. It builds a B-Class sized electric car for the Chinese market in a joint venture between Daimler and BYD. 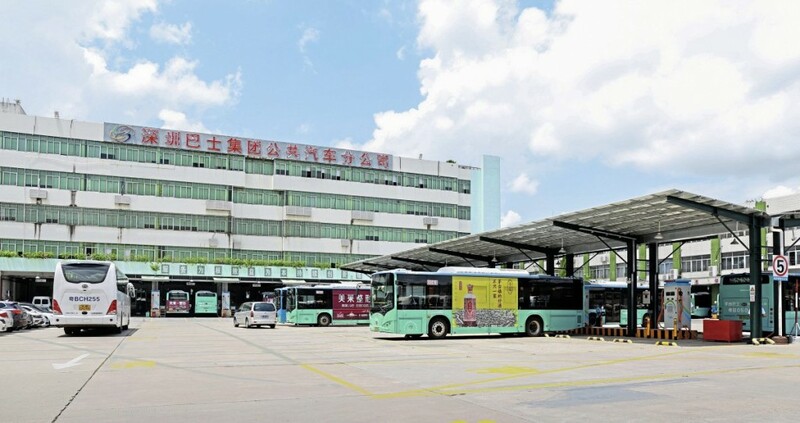 Visiting BYD’s vast facilities in Shenzhen’s Pingshan district you find it difficult to take in that the business has only been trading since 1995 and involved in vehicle production since 2003 and with electric buses for less than that. The electric bus industry is not a mature one; there is still a lot to be learned and this visit showed that BYD is in a very strong position to exploit its already extensive knowledge and experience of the topic. It showed quite clearly that if you are determined to switch to electricity for vehicle propulsion in a city it can be done, though it requires investment and there are difficulties to overcome as well as some uncertainties. There is still resistance to electric propulsion; even BYD still builds petrol-engined cars for sale in China because the demand balance has not yet tipped to the point that it can abandon doing so, but its belief is that the necessary mind change will come.